A Paula Wiseman Book, Simon & Schuster Books for Young Readers, 2017. 32 pages. Here’s a fun picture book that gives practice in perspective. Mouse is an artist. But he accidentally sets up his easel and paints on Hippo’s back. When Hippo rescues him and compliments his painting, Mouse decides to paint Hippo. In gratitude, Hippo does a painting of Mouse. The funny part of this book is how each one dramatically poses – and then each other one does a humorously simple representation. Hippo is so big, Mouse uses his biggest brush, and just swipes gray paint across the canvas. There’s no room for more detail. 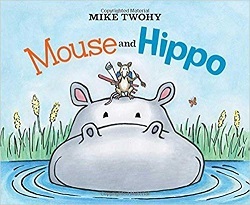 Mouse is so small, Hippo uses the smallest brush, and simply paints a small dot. He doesn’t have a small enough brush to paint Mouse’s whiskers. Also funny is how happy each new friend is with their painting. A fun story with an amusing new set of mismatched friends. This entry was posted on Saturday, October 27th, 2018 at 10:47 pm and is filed under Animal Characters, Picture Book Review. You can follow any responses to this entry through the RSS 2.0 feed. You can leave a response, or trackback from your own site.